“Don’t think about, just go!” was the last thing Hannah said to me before I took a deep breath and flung myself over the side of the boat landing in shin deep, crocodile infested waters. What happened next is kind of a blur. I ran as fast as I could to get to our anchor which was now buried about half a metre deep in mud on the river bank and all I could hear was Hannah’s voice shouting at me “it’s ok, there’s nothing there, just grab the anchor and run back!”. I was watching the long grass a few metres away from me to make sure there was nothing lurking in there waiting for the perfect moment to run out and maul me, when I finally got the anchor free and bolted back to the boat, anchor in hand. I jumped back onto the boat and started shaking with adrenaline! Even though we finally got our anchor free and back on the boat, we were still heavily stuck in the mud. After an hour of trying everything we could to get out, there was only one solution. Get back in that bloody water and push. 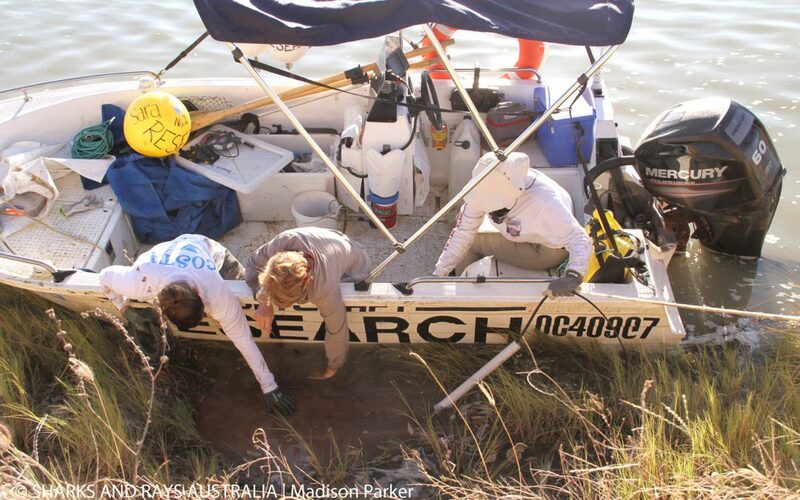 We had already been revving our engine for a while so once we rechecked the depth of the water around the boat and made sure we had a clear coastline, Barbara – our expedition leader, and I hopped back in the water and pushed our boat as far away from the bank and out of the mud as possible. If you don’t know the “urban rule” about crocs, it goes something like this: For every croc you can see, there are about 10 under the water that you can’t see. I call it an “urban rule” because the number seems to change from region to region. In Darwin they say 10 crocs, in Queensland they say 20. Either way, out here, in the middle of nowhere, I wasn’t in any way willing to test the rule. This act of stupid bravery, however, did earn me the nickname “Jesus” back at camp, since I ran through the water so fast it was like I ran on the water. And being among a group of biologists on a scientific tagging expedition when you’re just a business school drop-out…well let’s just say it gave me some “street cred”. The reality of the situation was that if we hadn’t gotten our boat free when we did, we would have had a veeeeery loooong day and night ahead of us, waiting for the pretty unpredictable tide to flood back in and free us. And this was only session one, of a ten-day expedition! We started the two-day drive to Normanton, Queensland on the 19th of June, last year, starting from Cairns, where Sharks and Rays Australia (SARA) is based. SARA was founded by Dr Barbara Wueringer, to “conduct scientific research to contribute to conservation efforts of endangered species”. Barbara has spent the last 12 years of her career capturing, tagging, and releasing lemon sharks, tiger sharks, and her favourite – sawfish, all over the world. She has had her research featured in publications including National Geographic, New York Times, Science Magazine, and Discovery Magazine. In 2015 SARA started measuring the “current distributions and abundance patterns of four species of sawfishes in Far North Queensland and the Cape York Peninsula”. Sawfish are a family of Rays, and have a characteristic long, flat, and narrow rostrum, lined with sharp teeth in a way that resembles a saw. They’re a pretty fascinating animal! Their rostra are covered with electrosensitive pores that they use to detect even the slightest movements of prey hiding in the muddy sea floors. They also use their rostra as a digging tool, and to slash prey as it swims by. If you haven’t already, make sure you YouTube a video of it – it’s amazing. Unfortunately, it’s because of their incredibly distinctive feature that they are now listed as critically endangered and at risk of extinction. It’s estimated that their population numbers are at less than 5% (to maybe as low as 1%) of their historic levels. Not only are they caught as bycatch in fishing nets because their rostra are easily entangled, they are also exploited for it, with fishermen butchering it off as a prize or to sell in some markets. Their fins are also taken to supply the distorted, delusional, and dangerous Asian market. Northern Australia is the last global stronghold for the four species of sawfish, as stated in on the SARA website. It’s believed that the coastline and river systems of the Cape York Peninsula most likely hold the highest densities of sawfish. In Queensland waters, sawfish have been declared a no-take species, but since the last assessment of their numbers ended in 2008, it’s unclear if the ban has had an effect on population numbers. And so… here we are. Our small team consisted of three marine biologists including Barbara, an animal scientist, our hilarious camp supervisor Andrew – who was essentially our very own Bear Grylls, and me – with my passion for marine conservation and my superhuman ability to run on water when I’m scared of being eaten alive by Jurassic creatures. Since my marine biology degree is non-existent, I have to do the best I can with what I’ve got.